MULTIPLE Sclerosis (MS) sufferers are being given the opportunity to be part of an unique study which, if successful, could initiate the launch of a first-of-its-kind treatment centre in Scotland. Scotland is said to have one of the highest incidences of multiple sclerosis in the world, with a reported 10,500 sufferers of the neurological condition living north of the border. The symptoms of MS are painful and can often be debilitating preventing sufferers from carrying out day-to-day activities. While there is no cure for MS, the Edinburgh-based MS Project Team is at the forefront of leading a new approach to treating MS sufferers and hope to develop a preliminary study with the results expected to establish the case for a pioneering treatment centre, potentially to be located in the capital. 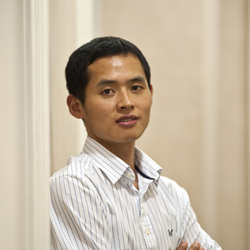 The MS Project Team comprises Chongsu Lee, of the Korean Physiotherapy Clinic in Edinburgh, and supporters, Chris Garner and Kerry Napuk, who advocate applying a vascular approach to treating MS – a method used by Chongsu which has recorded significant improvements in his regular clients. Others involved in the study include GP, Dr Neil Milliken, as independent evaluator, and Professor Stephen Platt, from the University of Edinburgh, who will act as an independent advisor to authenticate the findings. Chris Garner, therapist and author of ‘Prostate Cancer: a Natural Approach’, came to meet Chongsu through his own background and interest in natural therapy treatment and proposed the project based on Chongsu’s success in easing the symptoms of MS.
Chris said: “Chongsu has successfully treated a number of clients with MS who have not received much benefit from conventional treatments. “While treating MS sufferers, Chongsu found that there was an area of tension around the neck, shoulders and back which is thought to contribute to a poor level of blood flow between the brain and spinal cord. “Using his technique he found that by treating this area, the circulation improves, resulting in a reduction of MS symptoms. The results really speak for themselves with his clients experiencing major improvements in their mobility and general wellbeing after a course of treatment. Chongsu will conduct a preliminary study with up to 30 patients by treating them once a week for eight weeks, beginning in February and finishing in May 2013. Each patient will agree to release medical records, to have interviews and video profiles before and after treatments. During this period, Chongsu will train two therapists during the two-month period, which will demonstrate how his techniques can be transferred and prove activity can be scaled up to deal with more patients. Chongsu Lee, owner of the Korean Physiotherapy Clinic in Edinburgh’s Albany Street, said: “MS is a disease of the central nervous system and as a result of the symptoms nerve impulses don’t travel as well as they did before being injured. “Symptoms of MS can vary greatly depending on what the affected nerves are. Common symptoms include reduced mobility, lack of balance control, arms or legs weakness and increased tiredness amongst others. “Initial results with patients have demonstrated improved mobility and better balance within just a few weeks of treatment. During the treatment the therapist will gently massage head, shoulders, back and feet, which makes the patients more relaxed for the next stage of treatment. Then the therapist will gently stimulate parts of the body below the head, shoulders, upper and lower back to increase the flow of blood. In this way, the therapist releases tension and facilitates the body’s own natural healing process. To find out more about the project or for more information on how to participate in the study, please contact the Korean Physiotherapy Clinic on 0131 473 2333. MEDIA RELEASE posted by the Holyrood Partnership. You took can post media releases (aka press releases) on allmediascotland.com. For more information, email here.